I have started working my way through the Picture Book Reading Challenge hosted by Becky's Book Reviews. I'm doing the checklist option, so my goal is to read one book that matches each of 102 different categories. Today I'm sharing my selections for #50 a book published 2010-2016 (They All Saw a Cat), #65 a nonfiction picture book (Because of an Acorn), #76 hate the text, love the art (Real Cowboys), and #81 a book about weather (Little Penguins). 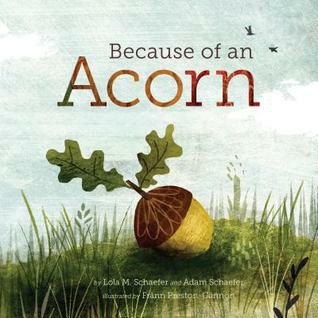 Because of an Acorn is a basic nonfiction picture book illustrating the connections that exist between all living things. The minimal text is great for preschoolers, though it is not enough in every instance to drive home the connection the authors are trying to make. (Miss Muffet needed a lot of explanation and clarification as we read.) The illustrations are immersive and appealing, and they portray the realities of the natural world (a hawk capturing a snake, for example) honestly, but not too graphically. I liked the book better upon a second reading, but I felt that I could have used a bit more text in the main part of the story. There are detailed notes at the end of the book, but they were too dry even for me, let alone for a child. 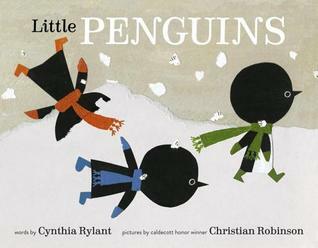 Little Penguins is written by the prolific Cynthia Rylant and illustrated by Caldecott honor illustrator Christian Robinson. I was not at all a fan of Last Stop on Market Street, so I was skeptical of this book, but I ended up liking it well enough, especially after reading it at story time. The text in this one is very minimal as well, and there isn't a whole lot to the plot other than going out into the snow and coming back in again, but it's just the right speed for kids between 12 and 24 months. My favorite spread in the book is the moment where the penguins come inside and whip off all their winter garb, leaving mittens and scarves scattered everywhere as the text says, "Off off off off off." 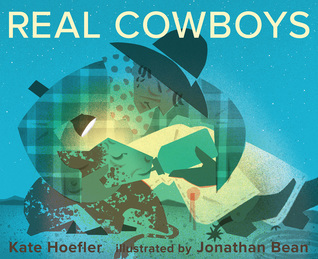 Real Cowboys has been on my to-read list for a while because it is illustrated by Jonathan Bean. Bean's pictures are lovely - Bo Peep actually adores the cow on one particular page and keeps mooing at it all the time - but the story clearly subverts traditional gender roles in a very obvious and obnoxious way. Yes, of course men can be gentle and nurturing and quiet and kind, but the image of cowboys just sitting out there on the plains stroking their horses and reflecting on their lives made me roll my eyes. The description of the book on Goodreads suggests that rowdy cowboys are a myth, and that this book presents the truth about what cowboys actually do, but I'm not buying it. I'm really curious as to whether the boys who pick up this book because they have an interest in cowboys are enjoying it or returning it to the library unread. Either way, we don't read "agenda" picture books at my house, so we are only looking at the pictures. Finally, They All Saw a Cat has an interesting concept, but the text is derivative of Margaret Wise Brown (see Four Fur Feet) and the illustrations, though wonderfully appealing, are just not enough on their own to sustain a picture book. All along, it feels as though the rhythm and repetition of the text are building up to something, but at the climax of the book, when the cats sees his own reflection, there is no satisfying resolution. The reader is left there at the height of the story, waiting for something more - and it never comes. This would have worked much better as a wordless book. As I've said in many picture book reviews on Goodreads, not all illustrators should write. 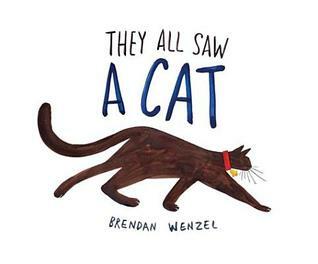 Wenzel should really do the illustrations for a book authored by a talented writer. This is probably going to win the Caldecott - or at least receive an honor - but that will be a disappointment for me.